The supply and demand model describes how prices vary as a result of a balance between product availability at each price (supply) and the desires of those with purchasing power at each price (demand). Kenneth Boulding, The Skills of the Economist, 1958, p. 19. 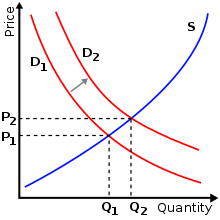 The field of economics is traditionally divided into two broad subfields. Microeconomics is the study of how households and firms make decisions and how they interact in specific markets. Macroeconomics is the study of economy wide phenomena. A microeconomist might study the effects of rent control on housing in New York City, the impact of foreign competition on the U.S. auto industry, or the effects of compulsory school attendance on workers’ earnings. A macroeconomist might study the effects of borrowing by the federal government, the changes over time in the economy’s rate of unemployment, or alternative policies to promote growth in national living standards. Microeconomics and macroeconomics are closely intertwined. Because changes in the overall economy arise from the decisions of millions of individuals, it is impossible to understand macroeconomic developments without considering the associated microeconomic decisions. Ragnar Frisch, Propagation problems and impulse problems in dynamic economics. (1933): 171. "Ragnar Frisch." in: The Concise Encyclopedia of Economics. 2008. Library of Economics and Liberty. 20 July 2014. Vernon L. Smith, "Relevance of laboratory experiments to testing resource allocation theory." Evaluation of Econometric Models. Academic Press, 1980. 345-377. p. 345. This page was last edited on 25 January 2017, at 03:42.